The wastewater treatment plant in 2016: Ratepayers will help pay it off through the year 2032. One reason is that Albany borrowed vast amounts of money for big new water and sewage treatment facilities that it still has to pay off. But since 2011, Corvallis has held off making changes in its wastewater treatment system because final regulations on river temperature — the same rules that prompted Albany to build its Talking Water Gardens in anticipation — have not yet been promulgated. Albany utility officials have briefed the council on recommended rate increases: 3.5 percent for sewers in July 2019; 5 percent for water in January 2020; and 17 percent for stormwater in March 2020. For the typical Albany household, the increases total $5.78 a month and will bring the average monthly bill for all three to about $120. By contrast, Corvallis approved increases last November of 2 percent for water, 2.5 percent for wastewater, and 8 percent for stormwater, totaling an increase of $2.10 in the monthly bill of the typical household. The monthly total in Corvallis now is just under $85, according to table of rates shown to the Albany council. 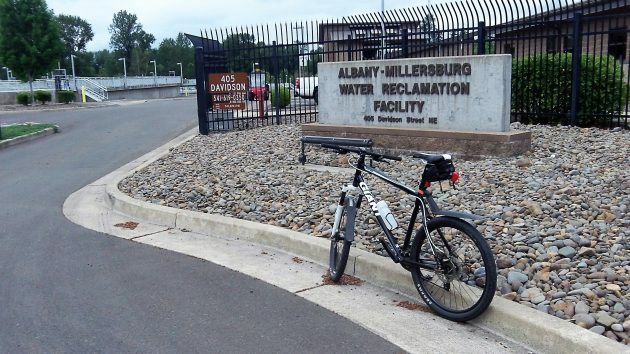 Albany borrowed about $77 million to rebuild and expand its sewage treatment plant and build the Talking Water Gardens. Paying this off costs $4.7 million per year through 2032, with Albany responsible for about $4.3 million and Millersburg the rest. A few years before, the city issued revenue bonds for a second water treatment plant near Scravel Hill and work on the Albany-Santiam Canal intake. After refinancing in 2013, those bonds are being repaid at about $1.9 million a year until 2037. Mary Steckel, the public works director of Corvallis, reminded me that comparing utility costs, even of outwardly similar cities, is hard because systems differ in many respects. In addition, Corvallis has just completed an asset management inventory of its water and sewage systems and is starting to see the need for future investments in those systems. More planning is in the works for seismic resiliency and other factors such as climate change. The reason is that Albany has never done a zero based budget. ZBB requires you list every task needing to be done and frequency, then determine how many man-hrs should be needed to do it; and then do the math to roll-up # of employees needed. That forces efficiencies. The flawed process used is -We have so many people now ; what more do we want to do so the cost is always higher. Of course both Cities must deal with PERS costs. Has either City changed contracts to defund public union influence wrt dues. I hate to throw out blanket statements, there’s a lot of good that’s going on in this city, the downtown is really coming along, people are moving here that are financially well off, the schools are being rebuilt. There’s a lot of positives. I do think there are two areas that need to be focused on (where the city actually has some control) )including this one pointed out by HH. 1) Why do we have such high workers compensation claims? This needs to be addressed, we’re spending a lot of money on workers comp, pointed out by Councilor Coburn. 2) We need an update on this water/wastewater situation, most of us know this “cannibal” system is a complete failure, we bought a lemon. I know because many times over the years, since this system was implemented, I’m over by that property and it stinks. On top of that, now we have the Talking Water Garden temperature issue, that system is also not functioning as advertised. So before the city staff starts making recommendation to CC they need more public treasure, we need something more than “we can’t talk about it, we’re in litigation”. Also, we’re running out of money from the settlement we received when it was discovered that the system didn’t work, most of it has been used to pay for the dump fees to get rid of the solid waste that can’t be processed, what happens when that money runs out? I know they’re working on something and I realize those that made the decision to purchase this system are no longer with the city, but those that took over need to tell us what’s going on. 17% increases on a tax that was just started a few months ago, that’s tone deaf numbers. Except that by law, the above end-half of your comment is absolutely true. When city staff is legally allowed to discuss, you’ll see it in here, in the DH, etc. It’s not “tone deaf” at all. If you read the information presented and available to the public: ( Starting on page 29 of https://www.cityofalbany.net/images/stories/citycouncil/archive/2019/ws_20190128_stf.pdf ) The 5-year planning (which changes every single year) shows the history, needs, how, when, etc., the rates come about. What is planned vs. what actually occurs as more information comes in, is always fluid and never matches. And the target[s] change every year – hence the need to forward planning. Council gets this decision-point meeting every year so the city doesn’t get surprised. I respectfully disagree, 17% increases in anything is “tone deaf”. I get it; inflation indicators, strategic planning, projected capital project expenditures, unlimited needs. Simply speaking from a PR perspective, passing a 17% increase of anything is not going to sit well especially when these others issues are hanging over this department. Before we start passing 17% increases for stormwater, shouldn’t we wait and find out what the wastewater issue is going to cost? We may need to use that money to finance another bond to fix “cannibal”, there’s no reference in these slides to the potential economic risk if “cannibal” can’t be fixed or there’s a permanent work around that has to be implemented or the party that we believe should pay for the failure decides they want to fight the litigation. This is a nice power point presentation but it doesn’t answer a lot of the questions. Perhaps those questions are being answered in executive session, but as the public, we just see staff asking for a 17% increase. As far as the wastewater system and all the complex details and legal entanglements involved, it comes down to… it smells like poop over there and it really, really smells like poop in the summer. Might be worth mentioning that the recommended 17 percent increase in stormwater fees is very small in dollars and cents — $1.27 for the typical Albany household. But also the city staff is recommending the same yearly percentage increase in each of the next six years. Those durn liberals in Corvallis seem to be more thoughtful on this topic than the money-changers in Albany’s City Temple. The debate is good and appropriate in a free country. Lot’s of things to consider, but the END result for everybody should the the preservation of a clean and healthful environment. Get things fixed; it’s not about pointing fingers.